Sri Ram Gram Vikas Samiti is an educational nonprofit, dedicated to providing quality, accessible education to children in rural villages with little formal infrastructure. The Savitri Soni Vidya Mandir Inter College began as one man’s dream to give back to his home! With IDRF’s vision and development strategy, the dream of an NRI to have a school in his native village could be fulfilled. In the beginning…the school faced tremendous opposition from villagers who believed once the children got educated, they would leave the village. The school had a modest start with two rooms, two teachers, a hand‐pump and no electricity, and provided free education to the children. Within a few years, school bought an old tractor trolley, as it could not afford a school bus. Soon, the tractor trolley had to make two trips to take the children to school. In order to save time for the students, IDRF was finally financed school bus. Now, the children from even further off wanted to attend this school, as its reputation spread. In order to provide education to more and more children, every few years IDRF financed more buses, now totalling to five. By now, the school expanded beyond Class 10th to include Classes 11th and 12th. 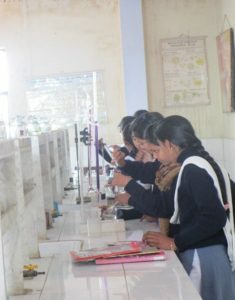 Previously IDRF funding could not support education beyond Class 10th and the students were required to enrol elsewhere in order to continue their education. However, due to the villagers’ concerns about the safety of girls traveling far, IDRF initially funded private classes for them beyond Class 10th. Eventually the enthusiasm of the villagers and availability of funds through IDRF has resulted in housing the senior classes within the school premises. The multi‐storied school building has all facilities, including science laboratories, a state‐of‐the‐art auditorium and faculty apartments. 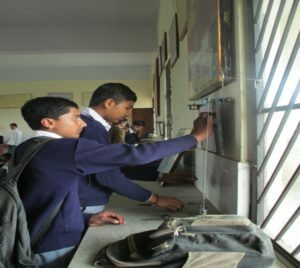 Recently, IDRF grants enabled the school to build a computer lab to impart computer education and skills among the students, smart class equipment to improve teaching and wrestling Hall. This video shows the fulfillment of the NRI’s dream to have a school in his native village. https://www.youtube.com/watch?v=SJnW32q924Y&t=67s. The Success of IDRF’s vision and development strategy is reflected by the fact that today around 1,000 students from 30 villages are brought by 5 buses. Students of this school perform better in state board exams compared to other schools in the region. The operational costs of the school are now met by the same villagers who opposed the idea of having a school more than two decades ago.